UK farmers are entering the final weeks of the 2018/19 beet harvest. Weather has again played a major factor in the yields which have declined compared to the 2017/18 crop. The UK processing factories in Cantley and Bury St Edmunds are due to stop slicing mid-February and the Newark plant will stop towards the end of March. Back in August 2018, EU industry executives predicted that there would be a fall in sugar production in the 2018/19. This prediction has proved correct with the top producing countries including Germany, France, Poland and Britain, all seeing a decline in beet sugar production by 2.8 million tonnes. Delayed planting due to snow, followed by increased rainfall in early March put European beet farmers on the back foot. Improved weather in April and high temperatures in May saw rapid beet development until the end of June, but subsequent prolonged dryness has consistently reduced yield forecasts and slowed beet harvesting as farmers have struggled to lift the crop from the soil. “As with most arable crops, sugar beet has been affected by the exceptionally dry and warm conditions this summer,” said Colm McKay, agriculture director at British Sugar. Sugar beet yields this harvest have dropped considerably compared with the record levels seen in the 2017/18 season; overall at the end of this years’ harvest, production will be less than the 1.37 million tonnes of sugar achieved last year. In mid-January, (16.01.19) the UK beet industry did increase its estimate for this seasons’ harvest due to higher than first expected sugar contents. The current beet forecast for 2018/19 is 1.15 million tonnes compared with the earlier estimate of 1.05 million tonnes reported in November 2018. Britain has over 3000 sugar beet growers but often people don’t even realise that there is a sugar beet industry in existence in the UK; people seem to think that all the sugar we use and eat comes from sugar cane grown in hotter climates overseas. However, the beet sugar industry supports over 10,000 jobs within the UK economy, from farmers to road haulers to processors. There is only one company in the UK which processes beet sugar, thus, sugar beet growers must ensure they get the best possible price. In this current 2018/19 season it was agreed between British Sugar and NFU Sugar that sugar beet growers would receive a minimum price of £22.50/t for the crop. However, it has been announced that the prices will decrease in 2019/20. 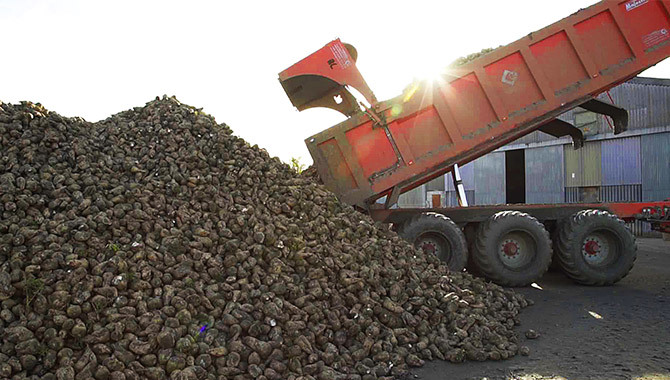 “Looking to the financial year 2019/20, a reduction in beet price has been agreed with our farmers and we expect sugar production to be affected by a lower crop area to be planted in spring 2019,” a UK beet industry spokesperson said. As for 2019/20 crop, no estimate is available for this spring’s sugar beet area, but farmers do face the prospect of growing beet without key neonicotinoid seed treatments after the ban of using them came into effect in 2018. Thus, it has been reported that UK beet sugar output could drop in the coming years as farmers could decide to turn away from beet amid low global sugar prices, on top of the ban on certain pesticides. “Growers are finding beets are no longer the attractive crop it always was,” said Martin Todd, managing director at LMC International, at the recent International Sugar Organisation’s annual seminar in London. In the past UK sugar beet harvest figures have gone up and down; in 2016 it was 0.9 million tonnes of sugar, in 2017 the UK produced 1.37 million tonnes. The record crop of 1.45m tonnes was in 2014.